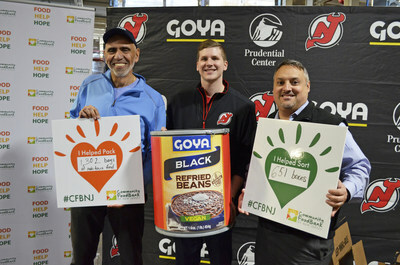 JERSEY CITY, N.J., April 4, 2019 /PRNewswire-HISPANIC PR WIRE/ — Goya Foods, in partnership with the New Jersey Devils, and Prudential Center donated 61,265 pounds of food to the Community FoodBank of New Jersey and hosted its annual Day of Service with over 30 employee volunteers from each company to help pack a portion of the products. The food donation, equal to 52,796 meals, was then distributed to families in need throughout New Jersey. About GOYA: Founded in 1936, Goya Foods, Inc. is America’s largest Hispanic-owned food company, and has established itself as the leader in Latin American food and condiments. Goya manufactures, packages, and distributes over 2,500 high-quality food products from Spain, the Caribbean, Mexico, Central and South America. Goya products have their roots in the culinary traditions of Hispanic communities around the world. The combination of authentic ingredients, robust seasonings and convenient preparation makes Goya products ideal for every taste and every table. For more information on Goya Foods, please visit www.goya.com.